So what is it and why do we have it? 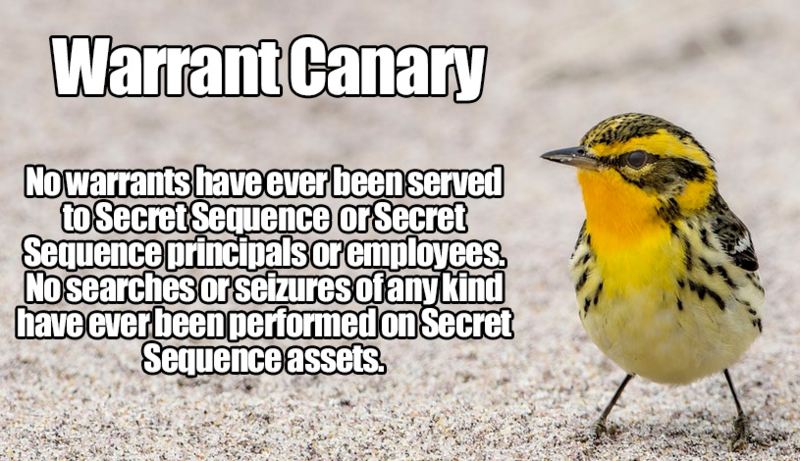 A warrant canary is an image, text passage, or some other media indicating that a party has not received any warrants or subpoenas from any government agencies. But why would we say that we didn’t receive any warrants, instead of informing our customers that we did? Section 505 of the USA PATRIOT Act expanded the power of the US government to seek information “relevant” to national security concerns, and the PATRIOT Act Reauthorization statutes added penalties for noncompliance or disclosure of so called “National Security Letters”. Effectively, this means serious legal penalties for a recipient of a subpoena that declines to comply or even notifies their patrons that they’ve received a request. That is to say, we can’t tell you if we’ve received a government subpoena, but we can tell you that we haven’t, and we can stop telling you we haven’t if it’s no longer true. What If The Image Is Missing? If you don’t see our warrant canary on the front page of this site, it means that we’ve received a government subpoena with a gag order. This prohibits us from disclosing the demands of the subpoena or the fact that we’ve even received one. What Information Can They Request? By law, National Security Letters may request only non-content information such as IP addresses, Usernames, dates/times of access, etc. By using a service like a VPN or Tor (more info on these in an upcoming blog post) you can hide your real IP address, and choosing a username with no relation to your personal life can help preserve your anonymity even if we were to receive a national security letter. If you still see the warrant canary on our main page everything is fine and there’s no cause for concern. However, even if the warrant canary is missing there’s still not much to worry about. Privacy is our #1 goal at Secret Sequence. We never ask for any personal identifying information, and any information we do have is automatically deleted after 60 days, so we would have almost nothing to provide if we were to receive a subpoena. Ultimately, the warrant canary is just one more layer of security we provide to protect our customers’ identities.